No matter whether it is an important love letter or an international express delivery, we bring your shipment quickly to the desired destination. In the banking and service metropolis it has always been important to be able to send documents quickly from one company to another. As car traffic in the city centre is increasingly more frequent than driving, bicycle couriers are the first choice for many shipments in order to deliver from A to B quickly and reliably. In the trade fair city of Frankfurt am Main, the couriers are always fully occupied. Above all the international airport, but also the role as an important trade fair city, ensure a large number of international express shipments. Together with various other start-ups, we are working on innovative concepts for urban logistics in Frankfurt: Our goal is to organize courier traffic as efficiently as possible and thus relieve road traffic. Frankfurt am Main is Germany's most important international financial centre and is known worldwide as a leading trading centre. Large banks such as the European Central Bank or the Deutsche Bundesbank have their headquarters here and shape the skyline of the metropolis. Our reliable and fast city couriers, also called Heroes, deliver important documents from one to the other. Frankfurt is also known for its cider, also known as Ebbelwei, Schoppe or Stöffche, among friends of tasteful enjoyment. The drink was served in the Hessian metropolis since the 18th century and has not lost any of its popularity since then. Especially in Alt-Sachsenhausen there are traditional Ebbelwei pubs with their original charm. Packator is your one-stop shop for all urgent shipments in Frankfurt. We work with national and local courier partners to ensure that all shipments are handled efficiently and professionally. In the busy city, courier services mainly rely on bicycle couriers. These have a long tradition in Frankfurt am Main: for more than 30 years they have flitted back and forth between the various media and financial companies in the metropolis. But the close international network also requires solutions for document dispatch, worldwide and quickly. Together with our courier partners we offer Packator Express solutions in Germany, the EU and worldwide. Trade fair city, financial and commercial centre: Frankfurt am Main is one of Germany's most important metropolises and is today considered a cosmopolitan city. With almost 750,000 inhabitants, it is the largest city in Hesse and the fifth largest in Germany. The conveniently located metropolis on the Main is therefore well connected. Thanks to its central location, the city is an important traffic junction. Above all the international airport, but also the many trade fairs and events ensure a large number of international express shipments in Frankfurt. The city is home to numerous world leading trade fairs such as the International Motor Show, the Frankfurt Book Fair and the Musikmesse. 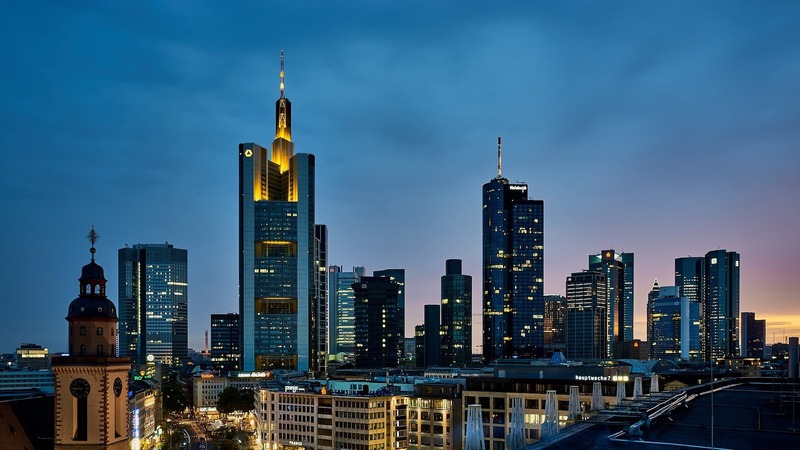 As influential financial centres such as the Frankfurt Stock Exchange, the European Central Bank or the Deutsche Bundesbank have their headquarters in Frankfurt, courier shipments play an important role. This is where Packator comes in. Important documents must be sent quickly from Frankfurt to Brussels? No problem with our international express courier service. We support our customers in preparing the correct shipping documents and handle customs clearance. Depending on start, destination and time, we choose the ideal shipping option. You will see when your shipment is delivered when you make your booking. For Germany-wide shipments that have to be delivered quickly, it is best to use our overnight courier service: We pick up your shipment on the day of ordering until 7 p.m. and deliver throughout Germany before 8 a.m. the next morning. Packator stands not only for 100% availability, but also for transparency when it comes to our conditions. However, we can only tell you the exact price of a shipment when you send us a specific request. Just give us a try! When calculating the cost of a shipment, we take into account the distance to be covered, the size of the shipment and the time frame available. Express deliveries are usually more expensive than standard shipments. If we can combine several consignments, this reduces the price of your consignment, whereas direct deliveries are usually more expensive. Call us, write us or use our chat service to find out the exact price for your shipment. We create clarity: you are spared nasty surprises at Packator, because we show you the exact price for your shipment thanks to our transparent immediate calculation before you send your order. Book online now quickly and easily!